A hotel by the name of “Bellevue House” was built in 1875 on the site of the present Country Club House. This hotel was opened by Mr. David Phillips and burned in 1900. The new Club House was built on this site in 1912. Up until this time, the clubhouse was situated on the edge of the golf course, at the end of Park Avenue. It was built in 1899 by Fred White. The course then was only a nine hole course which was extended to an eighteen-hole course in 1909. 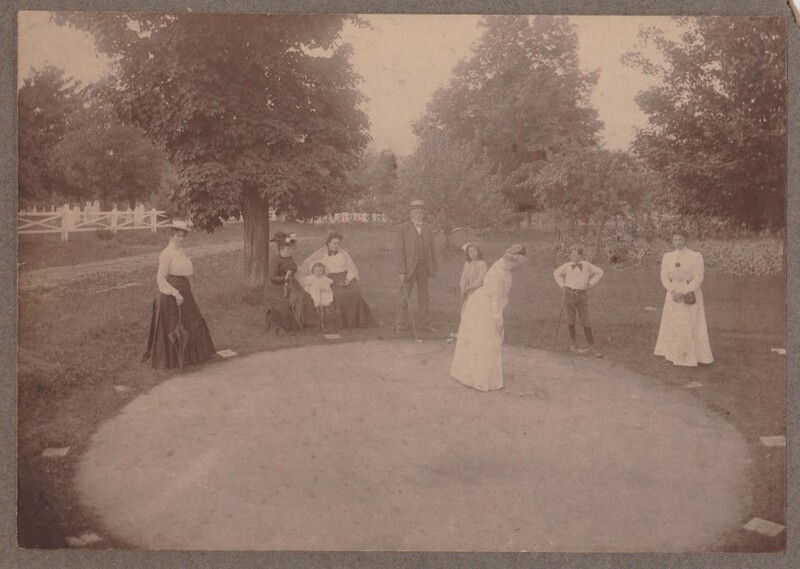 Golf soon became the greatest amusement of the town and the Bethlehem Country Club not only boasted of a good golf course with a new up-to-date clubhouse but had two fine public tennis courts where annual tournaments were features of the season. There was also at that time, a ball ground and ball stand on the corner of the golf course at the intersection of the cross street with Prospect street. This ball stand burned sometime in the 30’s. The town supported a baseball team composed of college and seminary players who played several times weekly during the summer season. These ball players were boarded at the various hotels. Bethlehem’s new Memorial Field, dedicated to those who lost their lives in World War 2, was officially opened on August 5, 1949. The new sports mecca is located at the end of Elm street at the rear of Bailey’s Garage and lights were installed for night softball games. The dedication game was held between the Bethlehem Town Team and the Bethlehem Boilermakers. A brief dedication pro­ gram was given before the game. 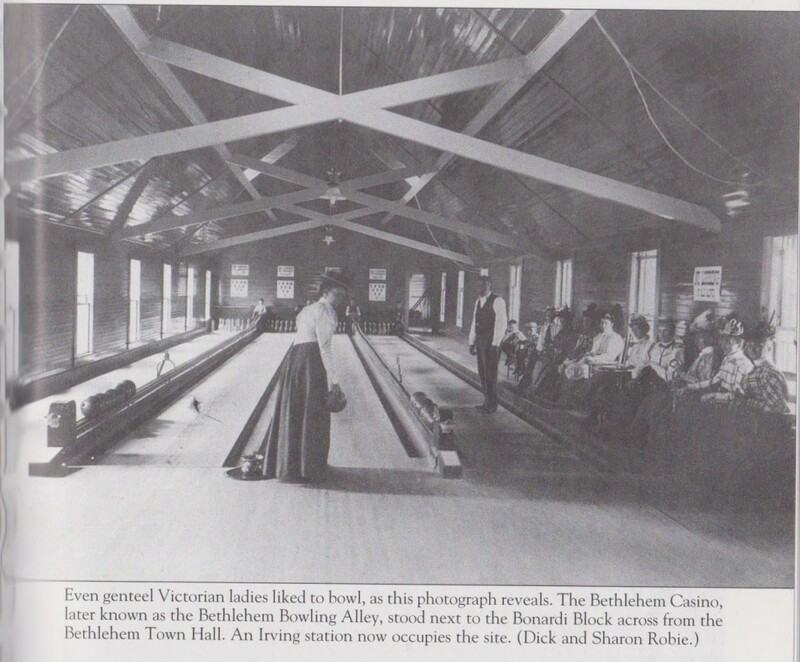 A casino was located on Main street on the site of the present Bethlehem Super Service Station. This casino furnished recreation with its bowling alleys and billiard tables. The local boys of the town were used as pin boys. Alfred Huntoon and “Ted” Gardner were the pin boys in 1908. The late Harry A. Goodwin was the manager of the alleys. 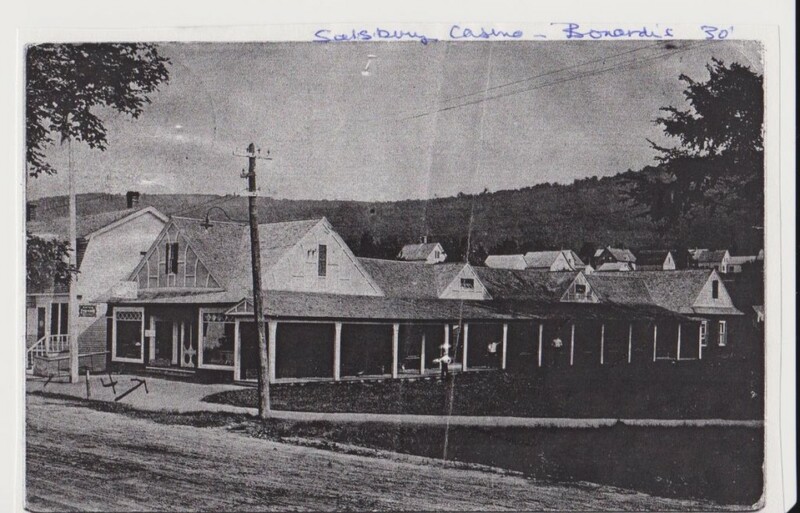 In the front of the casino were White’s Souvenir Store and Mr. and Mrs. Cooke’s store. Later, the front part of this building was converted into a garage and operated by Frank Bailey. The garage burned in May 1930. 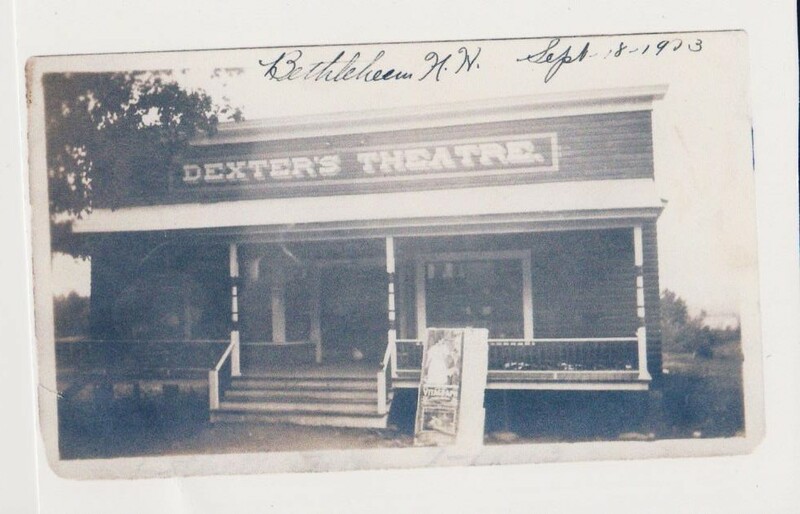 The first moving-picture shows in town were held in tents until the year 1913 when the first theater building was built by the late Arthur Dexter and was located on Main street opposite the Reynolds Hotel. This theater has been converted into a garage and is owned and operated by Frank Bailey. The second theater was built on Main street on the site of the Jefferson Spooner house that was destroyed by fire in 1884, and was opened in 1914 by Karl Abbott and Mil­ lard Clark and was named the Colonial Theater. Karl Abbott was a son of Mr. Frank Abbott, owner of the Upland Hotel. Opposite the Colonial Theater is the Eaton Block built in 1877 by C. N. Jones and opened as a souvenir store. This well-known store was carried on as Jones’ White Mountain Store for several years until C. B. Eaton bought the block and he, too, carried on a souvenir business during the summer months, going to Southern Pines, N. C. in the winter. 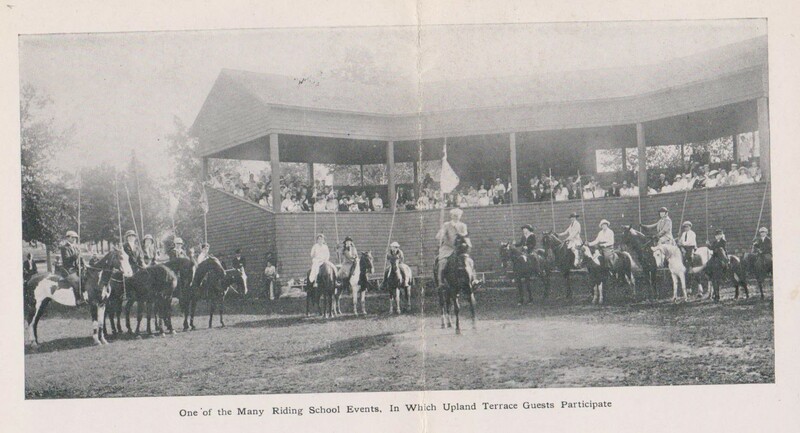 Another recreation enjoyed during the summer was horseback riding. 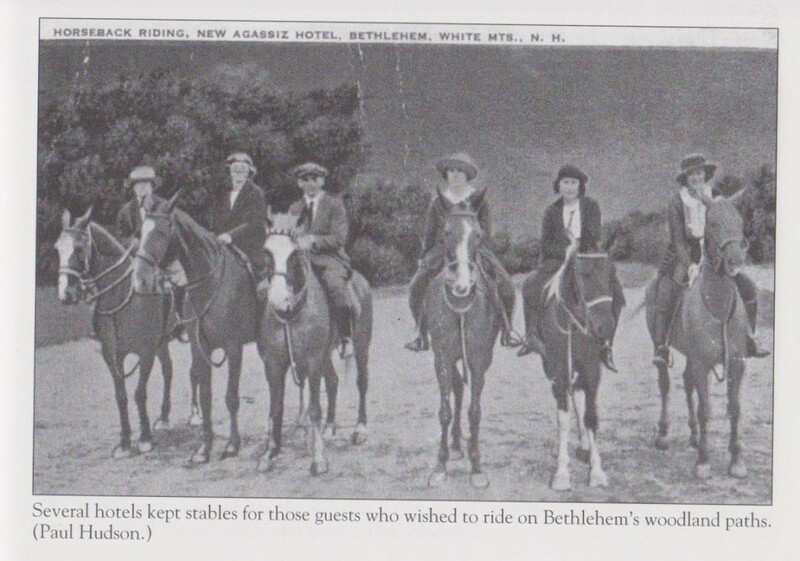 There have been several riding stables in Bethlehem but B. H. Pearson of Andover, Mass., was the first to have a stable exclusively for saddle horses. His stable was located behind the Colonial Theater near the site of Phil Martignetti’s cottage. Mr. Pearson returned to Andover with his horses in the winter, where he had a riding stable. Visitors to Bethlehem in the summer of 1888 were given a new source of delight in the open air concerts given in the evening. 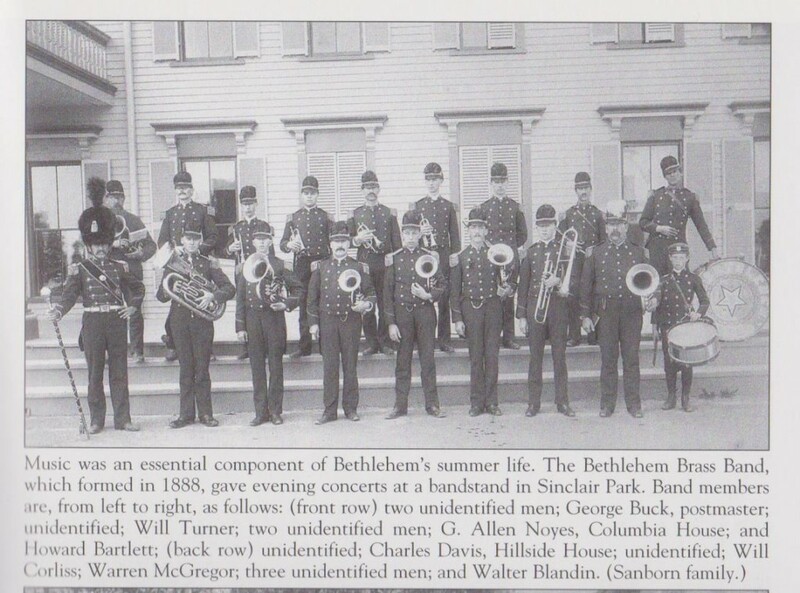 The citizens of the town had subscribed for a set of musical instruments and uniforms, and a stand was erected in the Sinclair Park where the Bethlehem Brass Band gave the concerts. This band consisted of eighteen performers and had been organized only six months. The following was its roster: F. H. Abbott, drum major; W. W. Wilder, piccolo; E. R. Day, clarinet; W. H. Corliss, E flat cornet; W. M. McGregor, solo B flat; S. B. Phillips, 1st B flat ; R. E. Wilder , 2nd B flat; G. D. Buck, solo alto; C. E. Davis, 1st alto; W. H. Turner, 2nd alto; G. H. Turner, 1st tenor; H. A. Phillips, 2nd tenor ; E. Jesseman , trombone ; G. A. Noyes, baritone; W. Lovejoy, B flat bass ; C. E. Vial, E flat basso; W. K. Blandin , bass drum and cymbals; and Howard Bartlett, tenor drum. G. Allen Noyes was director of the band. The New Hampshire Boy Scout Council is divided into ten districts. Bethlehem is a part of the White Mountain District. Edward Robertson of Jefferson is the executive in charge of Scouting activities in this area. The Bethlehem Scouts and Cubs were organized by Bill Houle in 1940 as Troop 230. Mr. Corbett, a retired Army officer, was the first Scoutmaster, and Bill Reardon was the first Cubmaster. The Scout Troop received first aid training under the able leadership of Scoutmaster Charles Whittier. In later years, the training paid off when Bernard Sanborn received honorable mention for first aid work in a train wreck in the State of Washington. Scout Sanborn also represented the troop at the World Monetary Conference held at Bretton Woods Mt. Washington Hotel. Scout Troop 230 received an award in World War II for collecting the most iron and paper of any troop in the White Mountain District. The project took four months. In 1944 Scout Philip Lyster, Jr., attended the Phelmont Scout Ranch in Arizona for six weeks where he made a record growth of four inches in height. Charles Whittier was an assistant Scoutmaster on that trip. A few years later the Bethlehem Boy Scouts and Cub Scouts participated in a parade in Littleton for Bette Davis which featured a movie premiere for this North Country lady who then resided in Sugar Hill. Over the years, the following men are among those who have done much to promote Scouting in our town: Scoutmasters Corbett, Charles Whittier, Philip Lyster, Sr., Leonard Greco, Russell Maguire George Blaney and Henry Drapeau. The late William Reardon, Sr., Elwyn Miller, Philip Lyster, Jr., Allan Jackson, Clem Hubert and many others have done exceptionally good work with the Cub Scouts and they are to be highly commended. Scouting in Bethlehem has really paid off in citizenship development and offers much to boys in camping, hiking, etc. 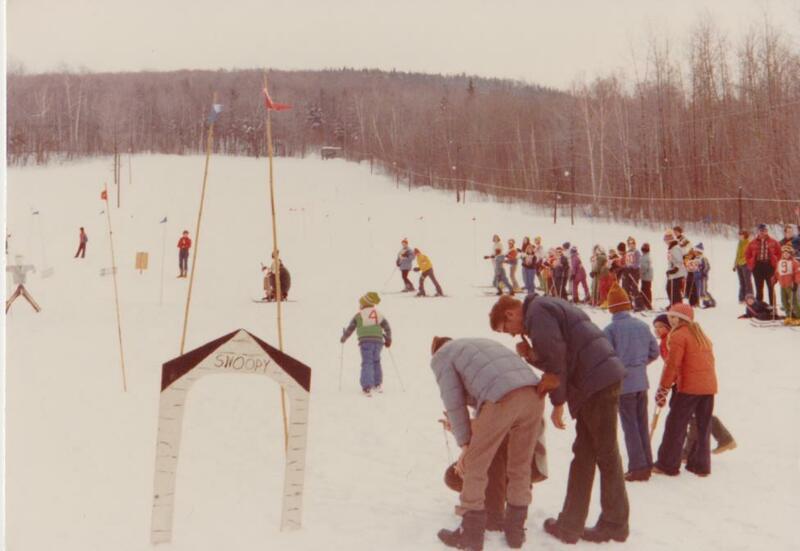 The highlights in our area are the camporees and the Klondyke Derby which is held near Jefferson. The Derby offers competition in first aid, fire building, and survival techniques. Locally, Scouts can qualify for camping, cooking, hiking and other merit badges at Midacre Farm on Wing Road. Henry Drapeau is the current Scoutmaster and there are about 30 Scouts in Troop 230. For those who want to do a good turn for their community and nation, I highly recommend Scouting. It is a golden opportunity for service.